Set to a historical backdrop of Buddhist kings and bustling trade, modern Nakhon Si Thammarat is a fast-paced cultural and commercial centre. The eponymous province boasts miles of coastal beaches to go with several waterfalls flowing amid a formidable mountain range. If you’re after a taste of unadulterated South Thailand and you don’t mind sliding off the tourist trail, give Nakhon Si Thammarat a shot. Based at the site of modern Nakhon Si Thammarat town (“Nakhon” among friends), the Tambralinga Kingdom maintained close ties to the Srivijaya Empire while also paying tribute to Chinese dynasties between the sixth and 14th centuries. The boomtown capital was situated at one end of a land route that linked the Andaman Sea to what’s now the Gulf of Thailand. At its zenith around the 13th century, Nakhon Si Thammarat (same kingdom, new name) was an independent kingdom that may have controlled most of the Malay Peninsula. Foreigners knew the kingdom as Ligor, a name that can still be seen in Nakhon today. In addition to trade, Tambralinga was an important crossroads for religions. Hinduism and Mahayana Buddhism arrived by way of the Srivajaya, which is thought to have maintained a measure of control, if not outright rule, over Tambralinga throughout much of its existence. In the 12th century, a Tambralingan king temporarily ruled over part of northern Sri Lanka, helping to facilitate the spread of Theravada Buddhism to Thailand. Around the same time, Sri Lanka-ordained Theravada monks renamed the city Nagara Sri Dhammaraja, a Pali term meaning “City of the Sacred Dharma King.” This evolved into “Nakhon Si Thammarat” when increasing numbers of Thai tongues arrived from Ayutthaya in the late 14th century. Nakhon Si Thammarat retained a measure of autonomy for a while longer: It wasn’t until King Taksin marched south in the 1770s that the city became part of Siam/Thailand for good. With a population of around 100,000, today’s Nakhon Si Thammarat is the second largest city in Southern Thailand, after Hat Yai. The majority is Buddhist but Islam is also prominent, and the Chinese have left their mark as well. The non-touristy atmosphere and low cost of living have also attracted quite a few expat English teachers from Western countries. While stacks of concrete structures aren’t winning Nakhon any architectural awards, some of the temples, mosques and shrines just might. History enthusiasts will enjoy a walking tour through the 900-year-old Wat Phra Mahathat along with portions of the ancient city wall, an excellent National Museum and a string of smaller attractions. Also don’t miss the studio, museum and theatre at Suchart Subsin’s House, one of Thailand’s most important venues for preserving the art of nang thalung, or shadow puppetry. Just west of Nakhon town is Khao Luang National Park and its numerous waterfalls backed by the park’s namesake peak, the highest in South Thailand. The rivers that form here are said to be Thailand’s cleanest, while blankets of fog help to produce exceptional mangosteen, rambutan, durian and other tropical fruits. Travellers in search of a rural homestay experience should head to the fruit-growing village of Baan Khiri Wong. Beach lovers can lounge on empty stretches of sand at Laem Talumpuk and Haad Sa Bua, both located within a 60 km drive of Nakhon town. For more plentiful beachside accommodation to go with isolated bays, caves and more waterfalls, head further afield to Khanom and Sichon. The ferry piers for Ko Samui, Ko Pha Ngan and Ko Tao are just 25 kilometres north of Khanom, making Nakhon Si Thammarat a fine post-island option. Straddling the Gulf of Thailand, Nakhon Si Thammarat is a fairly large province that borders Phatthalung and Trang to the south, with Krabi to the west and Surat Thani to the north. Officially known as Amphoe Mueang Nakhon Si Thammarat but commonly referred to as “Nakhon” or “Nakorn” throughout South Thailand, the provincial capital is 750 kilometres south of Bangkok and 115 kilometres south of the ferry piers for Ko Samui and Ko Pha Ngan. Nakhon town has a long and narrow setup stretching from north to south, a remnant of the ancient times when it was located along the coast (sedimentation has since placed 10 kilometres of land between the city and sea). Running through the length of town from north to south, the main drag is Rajdamnern (spelt Ratchadamnoen on some maps), which begins just east of the large Thalad Park to the north, passes close to the downtown train station and then runs past most of the city’s historical attractions en route to the National Museum in the south. Running parallel to Rajdamnern a couple of kilometres further east is Phatthanakan Khu-Khwang Rd (usually referred to only as “Phatthanakan”), which doubles as Route 4012. This is a major commercial road with several filling stations and modern shopping centres. Most of the roads that run from east to west are posted as sois (side streets) of either Rajdamnern or Phatthanakan. For example, Rajdamnern Soi 15 runs east from Rajdamnern to Phatthanakan Road. This gets confusing, as the sois also have their own names that are used on most maps, with no reference to the numbers. 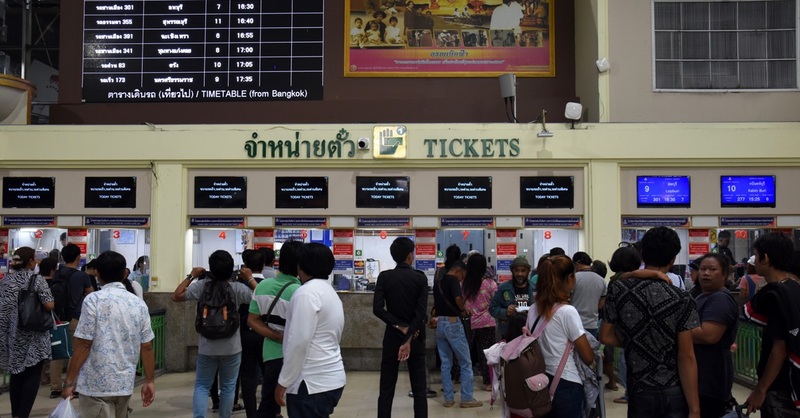 Most of the accommodation is found within walking distance of the train station, an area with a bustling downtown atmosphere amid a tangle of narrow roads like Yommarat and Klongtha. Head south down Rajdamnern and you’ll pass some excellent restaurants and cafes in the Bovorn Bazaar, followed by a few minor historical attractions on the way to Tha Ma Market and the police station, which is just north of the City Pillar Shrine and south of a roundabout between Yommarat and Rajdamnern. Continuing south on Rajdamnern, you’ll then pass the unusually helpful TAT office, located in a cluster of government buildings just north of the old city wall. Open daily from 08:30 to 16:30, the TAT is worth a stop to grab a city map and brochures covering the province’s outlying attractions. TAT-issued maps are also freely available at Teeny House. The immigration office is located on the far southeast side of town, near the corner of Phatthanakan Rd and Phatthanakan Soi 100, a couple of km due east of Wat Phra Mahathat. The large Nakhon Si Thammarat Hospital is found towards the south side of town on Rajdamnern Rd, just south of a large clock tower and north of Wat Phra Mahathat. There’s also the Nakhon Christian Hospital located closer to downtown and just northeast of the Chedi Yak (“Giant Chedi”) on Sriprad Road. Take Neramit Road east out of town from the train station and, after a few kilometres, Route 4102 continues straight to a cluster of seafood restaurants at a fishing village set where the Pak Nakhon River meets the Gulf of Thailand. From here you can see Laem Talumpuk, a long cape that juts out into the Gulf like a hand pointing its index finger back towards the mainland. To reach the beach at Laem Talumpuk, you’ll need to depart Nakhon town in the south and take a roundabout 60-kilometre route along routes 408, 4013 and 4231. Cutting west from the rough geographical centre of Nakhon town, Karom Road turns into Route 4016 and runs past the bus terminal on its way to Khao Luang National Park. Running north out of town, Phatthanakan Rd becomes Route 401 and continues all the way to Sichon and Khanom before cutting west towards Don Sak and Surat Thani. To the south, Rajdamnern Rd becomes Route 408 and shoots down to Songkhla province, where you can cut west to the Thale Noi Waterbird Park in northern Phatthalung province. Thale Noi is just over 100 kilometres south of Nakhon town and can be hit as a day trip. Please sign up as a Travelfish member to download the Nakhon Si Thammarat guide PDF (1.8 MB, 29 pages). Membership costs just A$35 per year (less than A$1 per week) and gives you access to over 250 PDF guides. Last updated on 18th February, 2017.  Use the above map to find specific destinations in and around Nakhon Si Thammarat which are listed on Travelfish. Bed icons indicate a guesthouse, hostel or hotel, the knife and fork is an eatery or bar and the four-way circular thingy marks sights, attractions and other points of interest. Click on any icon for a short pop-up and a direct link to the page for that spot. If you are in the area, use the teardrop icon near the top left to show your position on the map (you'll need to allow position sharing for this last feature to work).